Formula 1 heads to Baku for the third time for this weekend’s Azerbaijan Grand Prix. 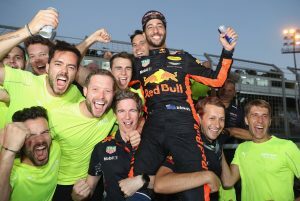 Red Bull’s Daniel Ricciardo will be hoping for back-to-back wins after victory at the Chinese Grand Prix, as well as a second straight win at this track, having claimed an unlikely win in Baku in 2017. 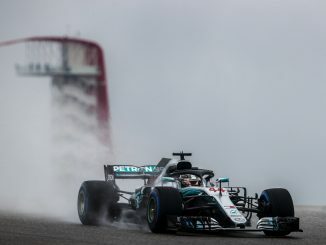 Sebastian Vettel leads the drivers’ standings by nine points heading into the fourth race of the year, while reigning champion Lewis Hamilton is still looking for his first win of the campaign. 3Legs4Wheels looks ahead to this weekend’s action. It may be quicker to list what didn’t happen last year! One of the most eventful races in recent years saw Ricciardo avoid all the incidents to secure the win, despite starting 10th on the grid. The Australian pulled off a stunning three-car overtake to pass both Williams drivers and Nico Hulkenberg following a restart after a safety car period, putting himself in a position to benefit when things went wrong for Vettel and Hamilton. The race is probably best remembered for the incident involving Lewis Hamilton and Sebastian Vettel behind the second safety car. Vettel ran into the back of his title rival before pulling alongside the Mercedes driver, gesturing and colliding with the Briton again. As well as causing damage to both cars, Vettel picked up a 10-second stop and go penalty, dropping him down the field. The race was red-flagged for a time to allow marshals to clear debris following a collision between the two Force India drivers. After the restart, Hamilton’s race was ruined by a loose headrest, forcing Mercedes to call him into the pitlane to ensure the device was fitted properly. Lance Stroll became the youngest rookie – and second youngest ever behind Max Verstappen – to secure a Formula 1 podium after finishing third, narrowly missing out on second after being passed by Valtteri Bottas in the final moments of the race. Kimi Raikkonen was classified 14th, but actually retired from the race twice! The Finn’s car had been pushed into the garage to retire after picking up damage from debris just before the red flag, allowing Ferrari to repair the car and get Raikkonen back in the race, only for an oil leak to end his race five laps before the end. 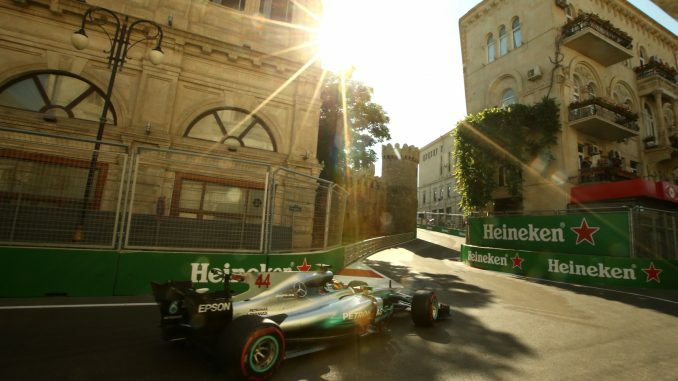 As a street circuit, there isn’t much that can be changed at the Baku City Circuit. The race will be the same distance as last year, with the same number of laps on the second longest track on the F1 calendar behind Belgium. However, Pirelli have opted for different tyre compounds to last year after no driver used the medium rubber during the race. Instead, drivers will have the soft, supersoft and ultrasoft tyres to use during Sunday’s race. The timing of the race could also make things different this year. Baku’s two previous races have taken place in the summer, but the race is taking place a couple of months earlier this year. 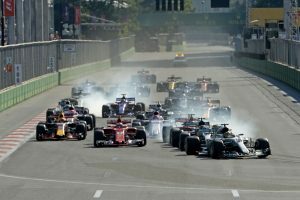 This means the cars will be running different temperatures to usual at the circuit, and the cars will be less developed than in previous years, with most teams saving their first major upgrades for the Spanish Grand Prix next month. Teams have previously come to this race having already run on a tight, twisty street circuit at Monaco, but this will be the first time this year’s cars have been tested on this kind of track. Speaking of tyres, there are a range of individual tyre selections for this weekend. 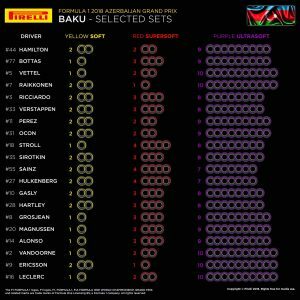 Last year, the supersoft was the preferred race tyre at Azerbaijan, but with a softer compound available this year, the teams appear to undecided over which tyre will be best. Ferrari, Sauber and McLaren’s Stoffel Vandoorne are leaning towards the ultrasoft, bringing 10 sets of the purple-striped tyre to the track. Renault aren’t convinced though – Hulkenberg and Carlos Sainz have just seven sets, and four of the supersofts. Three safety cars and a red flag period meant there was plenty of pitlane action last year. Ricciardo and Bottas both used four sets of tyres on their way to securing the top two steps on the podium, while Romain Grosjean completed four pitstops during the race. Unless it’s another incident-packed race this year, it seems unlikely there will be as many pitstops in 2018. 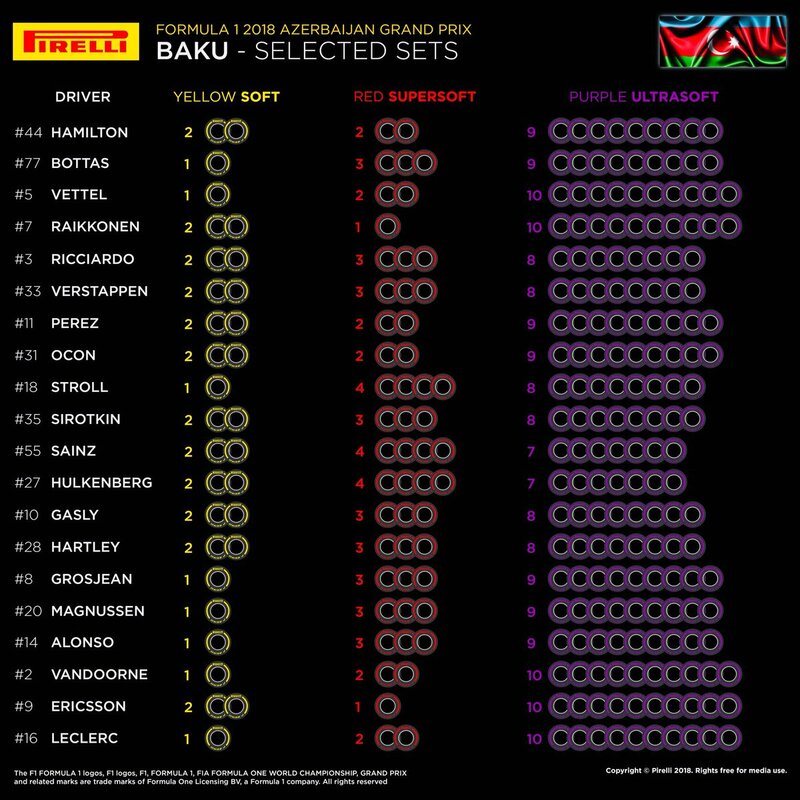 During the 2016 European Grand Prix, which was F1’s first visit to Baku, the majority of the top 10 completed the race distance with just one pitstop, switching from the supersofts to the softs, while some drivers needed to make two stops. Baku is typically around 12°C colder at this time of year than in June when last year’s race took place, and there’s more rain at this time of year. However, the current forecast suggests wet tyres and intermediates won’t be needed this weekend. Friday and Saturday are actually expected to be unusually warm for this time of year, with temperatures reaching up to 24°C in the city. Conditions will vary between sunny and cloudy throughout practice and qualifying. On race day, the forecast suggests it will be a little cooler at around 19°C with more cloud and wind, but still fairly mild for April in Baku. Cooler conditions on Sunday could mean some teams go into the race unsure which tyre will work best on the day. Azerbaijan is still a relatively new race so it’s difficult to judge how important grid position is at the track. In the two races we’ve seen in Baku so far, half of those to finish on the podium have started outside the top six, including last year’s race winner. However, Nico Rosberg won from pole in 2016. 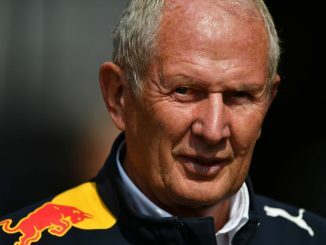 Two drivers will be coming into this weekend desperate to avoid another incident – Sebastian Vettel and Max Verstappen. Verstappen has come in for criticism after colliding with Vettel in China last time out after also damaging his car in Bahrain, while Vettel will be keen to avoid a repeat of last year’s incident with Hamilton. A safety car always seems likely at a street circuit. Racing had to be neutralised three times last year before the red flag came out to deal with debris. 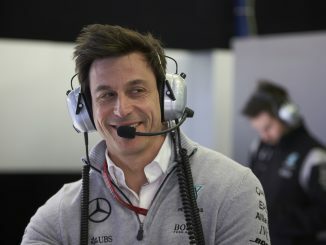 A number of drivers expressed surprised that there were no safety car periods during the first running of the race in 2016, with few incidents during that race. Outside the top three teams, McLaren and Renault are leading the way in the best of the rest battle, despite the strong performances of Kevin Magnussen for Haas. Magnussen’s Haas teammate Romain Grosjean has struggled so far this year, following a retirement in Australia with 13th and 17th-placed finishes. While the Dane finished seventh in Azerbaijan last year, Grosjean has struggled at the track, finishing outside the points on both previous runnings of the race. Don’t expect Williams to repeat their previous performances in Baku though. The team have never had a driver start lower than ninth in Baku, but Stroll and Sergey Sirotkin have both dropped out of qualifying in Q1 in the last two races. It’s difficult to see Stroll getting anywhere near his third-placed finish from 2017 this weekend. However, Sirotkin could be one to watch as he got on well with the track during his time in GP2 and F2. In 2016 he claimed two podium finishes at the track, before picking up points in the feature and sprint races last year in his only F2 event in 2017. Sauber’s Charles Leclerc will also be hoping this track is the one that gives him his first F1 points, having won the F2 feature race in Baku last year. Hear what the 3Legs4Wheels team have to say ahead of the Azerbaijan Grand Prix on this week’s podcast and check out the podium predictions. You can also follow our live blogs during qualifying and on race, and let us know what you think through Twitter and Facebook.